Do you sometimes wonder what you would do in the event of an electrical malfunction in your business? Electricity is a fundamental necessity in every business, which means that the consequences are dire in the event of an electrical emergency. Whether the electrical emergency is an electrical fire, malfunction or anything in between, it is paramount that you are prepared. But how exactly do you prepare for an electrical emergency? To prepare for an electrical emergency, the first thing you need to do is familiarise yourself with electricity and how it behaves. Electricity is basically energy that is transferred through a circuit. Circuits take many shapes and forms and can transfer a great deal of electrical energy when managed correctly. It is only when the circuit is compromised that an electrical emergency can occur. Electrical currents behave in a very unique way and certain materials conduct electricity better than others. Before you can effectively prepare for an electrical emergency, you must be familiar with the nature of electricity. Once you have a grasp on this, you can safely proceed with your emergency plan. Make a plan – what will you do in an electrical emergency? In any electrical emergency the stakes are high. If an electrical emergency isn’t well handled, then you could sustain significant property damage, injury and even death. When you make your emergency plan, ensure that safety is your number one priority. No amount of property is worth the loss of a life, so be careful and don’t take any unnecessary risks. There are a few basic things that your electrical emergency management plan should include, and some of these are listed below. In an electrical emergency the first thing to do is avoid any electrical hazards and contact a qualified electrician. Electrical work should never be attempted by anyone without the necessary qualifications and experience. You should identify any potential electrical hazards that have arisen as a result of your electrical emergency. Be sure to avoid these hazards and leave any repairs or examination to a professional. If your business relies on electricity to preserve stock, then you should have access to a reserve power source such as a generator. Generators vary in size and you can usually find one that will meet your needs, depending on the size of your commercial operation. However before you attempt to reinstate power to your business, you must wait for a qualified electrician to give you the all clear. Trying to restore power to your business is extremely dangerous if electrical hazards are still present. 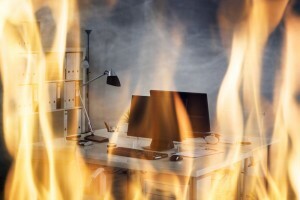 Waiting for a professional will ensure that all electrical hazards have been addressed, so that you can safely restore power to your business from a backup source. Safety equipment plays a major role in the effective management of an electrical emergency. Because electricity behaves in a unique way, dealing with electrical hazards often requires specialised equipment. For example, electrical fires will only intensify if you try to extinguish them with the wrong substance. Water is highly conductive and it is extremely dangerous to use it anywhere near electrical hazards or fires. This is where a good fire extinguisher is important. You should ensure that your electrical emergency plan includes a fire extinguisher that is suited to electrical fires. Your electrical emergency plan should also include a good first aid kit. These are important when it comes to treating electrical burns or other such injuries. For all your electrical emergencies and general electrical needs in Bundaberg, contact the experts at K Electrical today on (07) 4152 2177.